We&apos;ve compiled a list of romantic restaurants and special Valentine&apos;s Day menus. 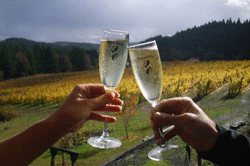 Whether you are popping "the question" or just the champagne cork, Oregon is an ideal destination for engagements, weddings and anniversaries. Savor this lovers&apos; holiday with a romantic hotel package and make the magic last all week! Regular dinner service, with a special Valentine&apos;s Day menu as well as a special wine pairing dinner in the Club Room. Win fun prizes shooting Cupid's Arrow from 5 - 7 p.m. Regular menu. Reservations accepted for parties of 10 or more. Complimentary chocolate with the purchase of a glass of wine. Special bottle prices available. Regular menu with special entree options. 8 a.m. - 3 p.m. & 4 - 9 p.m.
February 14 - 16 - Special gluten free Chinese food menu offered for dinner. Regular menu for lunch. For dinner there will only be a special three course menu, as well as a limited bar menu. Choice of two house beers or wine, two special entrees and one dessert. Live music in the eateries from 5 - 7 p.m.
9 a.m. - 2:30 a.m.